In this comment we will focus briefly our attention on the "treasure of the passion of our Lord that everyone is invited to meditate in order to be fed and saved" as we can read in the Imitation of Christ, a classic of Christian spirituality. After all the slow and simple reading itself of the account of the passion is already an act of faith and a proposal for life, especially in the perspective of Luke’s Gospel. In fact, the third Evangelist gave an "existential" impression to the plot that he had already received from the most ancient Christian tradition: it is as if he were drawing a path that every disciple must follow in the footsteps of his Lord. Following Jesus in His passion, the Christian is called to a personal and vital adhesion to be accomplished in Jerusalem, the city that is the destination of the earthly and spiritual journey of Christ and his disciple. So, Simon of Cyrene and the women of which Luke gave us a very accurate portrayal, were no spectators or neutral witnesses, but they were almost models of those who followed Jesus even in his final and decisive moment. 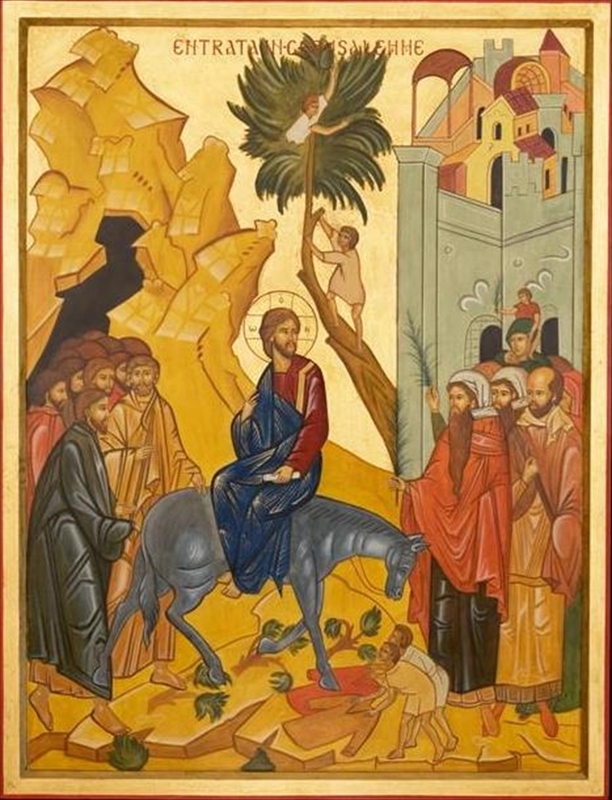 About Simon, Luke noted that "they laid on him the cross to carry behind Jesus" and this expression is normally used by the evangelist to define the commitment of the disciple who "takes up his cross daily" following his Lord even in his final offering. The women "beat their breasts" and this gesture was repeated at the end of the narrative from the crowds that " they all went back home, beating their breasts." This act is a symbolic representation of repentance and conversion that arouse by the appeal of Christ: "Weep for yourselves ...."
Jesus on the cross provided the disciple with another great example to be embodied in life, that of forgiveness of sinners and of offences received: "Father, forgive them for they know not what they do." It is a lesson that Jesus repeated throughout his life on earth and that the first Christian martyr, Stephen, would welcome and put into practice at the very instant of his death (Acts 7:60). In this line of complete love, forgiveness and self-giving we can also place the episode, which is reported only by Luke, with the repentant criminal to whom Jesus granted the gift of salvation in the Kingdom. With that sinful man we all have to repeat: "We rightfully receiving the due reward of our deeds, but this man has done nothing wrong." And with these words of conversion God will throw open the arms of his merciful love also for us. According to Luke, Christ, even in his death, has become the sign of another way that we must follow, that of perfect abandonment in God's hands. As it is known, it is only Luke that mentioned another final prayer of Jesus dying on the cross, in addition to the desolate cry of Psalm 22 ("My God, my God, why have you forsaken me?"). In fact, Jesus quoted the words of Psalm 31 and said: "Father, into your hands I commend my spirit." It is like the synthesis of a long lesson that Christ spread in Luke's Gospel on this issue. This means that according to Luke the last word that emerges from the lips of Jesus, is in that "Father!" pronounced at the end with serenity and confidence. At the beginning of the Gospel of Luke, Mary is shown to us as the one who "kept all these things and pondered them in her heart" (2:19.51). Therefore, to understand the deep meaning that is hidden beneath the outer covering of events of Christ’s Passion we must "observe, re-think, meditate." pouring Yourself out for the good of all, and also of Your very enemies. Oh, how Your Will and Your love triumphed in the midst of Your enemies! and with Your Will You would chain them. and Your love would turn on the light in their minds to make You known. They would open wounds on You, and Your love would heal the wounds of their souls. forced them to prostrate themselves before You and to confess You as true God. in Your pains during the course of Your mortal life down here. Now, in Your likeness, You made the soul free in her will and in her love. but no one – no one can do so with her interior, with her will and her love. run into the hearts of all to strike them with our love, to chain them with your will, and make of them conquests. Greater dowry You could not give to the creature. But where can the creature make greater display of this free will and of this love? and you let Yourself be dominated. and You keep her at Your side like a queen. and the other creatures compete to let themselves be dominated by this soul. the more You feel absorbed in the soul. Your action, step and heartbeat being absorbed in hers. So, we need to follow the path of contemplation, reflection, and silence. It’s important to create a space in the liturgy so that the Word of God can enter into our lives and flourish.